Hydrogen’s size allows cell transformations responsible for longevity, performance enhancement and even weight loss without dieting. of magnesium with micro-encapsulated malic and fumaric acids and 74 bio- available coral minerals. As the capsule ingredients react, millions of tiny H2 bubbles saturate the body’s cells to raise mitochondrial (energy) and antioxidant activity, especially SOD and glutathione, as well as positively influence cell signalling and gene expression. These anti-aging effects may increase one’s overall state of health, say anti-aging physicians such as Julian Whitaker, MD who’s begun to recommend molecular hydrogen to patients as a daily supplement. Aoki K, Nakao A, Adachi T, Matsui Y, Miyakawa S. Pilot study: effects of drinking hydrogen-rich water on muscle fatigue caused by acute exercise in elite athletes. Med Gas Res. 2012 Jul 12;2:12. doi: 10.1186/2045-9912-2-12. ecollection 2012. Ishibashi T, Sato B, Rikitake M, Seo T, Kurokawa R, Hara Y, Naritomi Y, Hara H, Nagao T. consumption of water containing a high concentration of molecular hydrogen reduces oxidative stress and disease activity in patients with rheumatoid arthritis: an open-label pilot study. Med Gas Res. 2012 Oct 2;2(1):27. doi: 10.1186/2045-9912-2-27. Nakao A, Toyoda Y, Sharma P, evans M, Guthrie N. effectiveness of hydrogen rich water on antioxidant status of subjects with potential metabolic syndrome-an open label pilot study. J clin Biochem Nutr. 2010 Mar;46(2):140-149. doi: 10.3164/jcbn.09-100. e-pub 2010 Feb 24. Oharazawa H, Igarashi T, Yokota T, et al. Protection of the retina by rapid diffusion of hydrogen: administration of hydrogen- loaded eye drops in retinal ischemia-reperfusion injury. Invest Ophthalmol Vis Sci. 2010;51:487–492. Hydrogen is hundreds of times smaller than other antioxidants like our old friends vitamin C and glutathione. Antioxidants fight oxidation inside and out, keep people younger and prevent premature tissue aging and death. As it turns out molecular hydrogen, because of its ease of access to interact with every area of the cell, is an effective antioxidant. A study examined the antioxidant potential of molecular hydrogen in an open label, 8-week study on 20 subjects with pre-diabetes symptoms. The consumption of molecular hydrogen for 8 weeks resulted in a 39% increase in antioxidant enzyme superoxide dismutase (SOD). Further, subjects demonstrated an 8% increase in high density lipoprotein (HDL)-cholesterol and a 13% decrease in total cholesterol/HDL-cholesterol from baseline to week 4. Muscle contraction during short intervals of intense exercise causes oxidative stress, which can develop overtraining symptoms including increased fatigue, muscle injury and inflammation. Ten male soccer players, average age 20, were subjected to exercise tests and blood sampling. Intake of molecular hydrogen prevented an elevation of blood lactate during heavy exercise. Peak torque significantly decreased in the control group in the early phase, suggesting muscle fatigue, but didn’t among the molecular hydrogen water group. This means more endurance in the hydrogen group. H2-loaded eye drops were prepared by dissolving H2 in saline and directly administering to the ocular surface. The direct application of eye drops containing H2 ameliorated pressure and oxidation. Cold weather is the time when building immunity becomes a matter of survival. Since certain types of foods provide our best immune building power, let’s enjoy summery flavor while giving our bodies the spices and peptides it needs. In this month’s recipes, you will see a common theme of foods like onions, garlic, ginger, turmeric, rosemary and also some powerful immune-building supplements. And, since we all love sweets there is also a way to give our bodies a big boost while pumping up the protein and essential fatty acids. Go for it, so you can sail through the winter and be ready to cruise into spring. Chef Susan Teton’s online courses at www.chefTeton.com supply recipes for raw, cooked and cultured foods. Optional Supplements: Immune-Tree Colostrum6 and up to 1 tsp of Coral EcoPure. Optional Sweeteners: sugar, honey or maple syrup. In a food processor blend all of the ingredients, except walnuts, until smooth. Place mixture into a spring form pan or glass dish. Line with wax paper so it will be easier to remove in one piece. Press walnuts into the top of the mixture and refrigerate. Remove when it is firm and and cut into desired pieces. Keep refrigerated. Drink away heart disease risk with juices from the local grocery led to improvements in cranberry juice cocktail’s polyphenols whose effects on blood flow, arterial stiffness and blood pressure are apparent within 24 hours, says Dr ana Rodriguez- Mateos, a cardiology professor at the University of Düsseldorf in Germany, at the 2015 Cranberry Health Research Conference. Ten healthy men between ages 18 to 40 drank two cups of sweetened cranberry juice a day. their blood flow, arteries and blood pressure were measured over 24 hours. even cocktail cranberry all aspects of circulatory fitness. More good news for the holiday season: cranberry sauce has been found to protect from infections, inflammation and lower heart disease risk. Cut figs and soak in the 1/3 cup water. Add the vanilla and Lite&Sweet to the water mixture so that it can dissolve. Grate ginger. Mix coconut oil, ginger and wet mixture. Add into dry ingredients and salt to taste. Prepare for refrigeration by lining the container with wax paper or plastic wrap with edges hanging over the side of the dish (this makes for easy removal of contents). Press mixture into the dish and refrigerate. When firm, remove and cut into pieces. Keep refrigerated. Steamed veggies of choice (shown here are cauliflower, broccoli and carrots). What makes this recipe delicious is the flavor of Dr. Praeger’s Super Greens Veggie Burgers. They have a veggie flavor with spices (black pepper, cayenne pepper, coriander) to enliven any dish. Since everyone always asks me, “What do I do with vegetables?” here is an answer. And it is so simple. Place coconut oil in a skillet until it is hot. Add in onions and garlic and sauté until onions are close to caramelizing. Move them to the side of the pan and place the patties in the skillet and cook along with the onions while they caramelize. In a saucepan steam veggies of choice until desired tenderness. When the burger patties are thoroughly cooked, add them to the onion mixture and top onto the steamed veggies. Add other veggies and/or tomatoes as desired. Top with fresh olive oil, and salt and pepper. Dried plums feed good bacteria by doing so they may reduce the risk of colon in your gut, says a study from texas a&M University in College Station, and the University of North Carolina at Chapel Hill, funded by the California Dried Plum Board and presented at the 2015 experimental Biology Conference in Boston. these good bacteria reduce colon cancer risk too, according to the study. “Through our research, we were able to show that dried plums promote retention of beneficial bacteria throughout the colon andcancer,” Dr. Nancy Turner, Texas A&M AgriLife research professor in the nutrition and food science department, said. The intestinal contents and tissues that were examined had significantly reduced numbers of aberrant crypts, aberrant crypt foci and high-multiplicity aberrant crypt foci, meaning lower cancer risk. these aberrant crypt foci are one of the earliest observable precancerous lesions and are often considered to be a strong indicator for cancer development. Mince rosemary leaves. Place all ingredients together in a saucepan and cook (the slower the better) on low to medium heat until food contents are soft. When veggies are soft, place entire contents of pan into the blender. Add miso and ImmuneTree Colostrum6 and blend until creamy. Yum! Place all ingredients in a blender and blend until smooth. Salt and pepper to taste. Top salad greens with berries and walnuts. Mix all ingredients together. 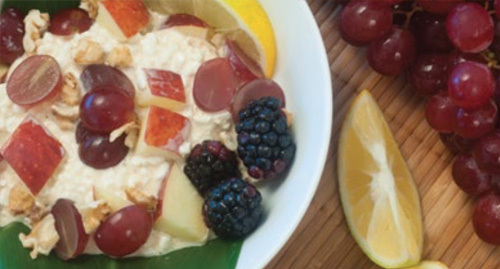 Add toppings of choice: grapes, bananas, walnuts, apples or berries.